On December 5, Fjordman published an article at FrontPage Magazine entitled “Internet Hate and Double Standards”. Among others, Fjordman links to an allegation by a “science historian,” one Vidar Enebakk, that a group of people stand behind the pseudonym Fjordman, rather than a single, courageous Norwegian who has taken this nom de plume. In this vein, if it pleases Monsieur Enebakk, I am Fjordman. I am sure a few hundred others in several countries will stand up and declare, “I am Fjordman.” All reviled opponents of the New World Order, who refuse to be Multicult’s slaves. One could only wish the science historian knew something of the kind of history that dispels the fog of conformist stupidity. Starting with the Bible: the greatest historiography book of all time that, not too long ago, was on every bed stand in Norway. For what Mr. Scandiprogressive is throwing at Fjordman is what the Israelite or Judean crowd was saying about every prophet warning about the consequence of bad mores and attitudes that had taken hold. When Jeremiah warned King Zedekiah and the Judeans not to fight the Babylonian army, or else there would be disastrous consequences, they threw him into a well, fought the Babylonian besiegers, and lost half their population, their temple and their country in that war. When Jesus pleaded that they change their ways and render to God and Caesar what was due, they accused him of blasphemy, delivered him to Pontius Pilate, didn’t change their ways, took up arms against Rome, and lost their country and half the population, again. There are at least a dozen such stories in the Bible, and there is Cassandra in the story of the fall of Troy (e.g. in Aeschylus’s Agamemnon). These events must have happened, and they have all been written up for posterity’s benefit — so that we not repeat the same mistakes. What Fjordman and several other clear-seeing thinkers are saying, myself included, is not to encourage people to wage war but to warn against the ruling elites policies that will bring war. We are the anti-war crowd; the Enebakks are the warmongers. Moreover, while the Snatchers-in-charge persecute the warning prophets, Nazi movements are sprouting all over under their noses. The stronger the Progressive rulers clamp down on Fjordman & Co., i.e. the reasonable, thoughtful opposition, the greater the power they bestow on the renascent Nazis. As to accusing the ruling elite of treason, it’s not the accuser who should be brought to account but the regime that commits the treason. Just so that we don’t get confused, treason has two universal meanings. The second one is “betrayal of trust or confidence.” Ruling elites who on account of their folly deliver their peoples to the present and future woes of Islam-infused Babylon with all social capital destroyed and most of the material and cultural ones too, betray their nations’ trust. That’s all there is to it. Belshazzar calls his necromancers but no one is able to decipher the meaning of this strange inscription. Then Daniel is summoned, he interprets the four words as a prediction of the end of Belshazzar and of Babylon too. 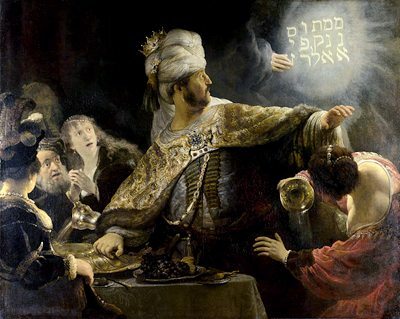 Belshazzar then rewards him handsomely and promotes him to a high position. That night, Belshazzar is slain and Darius the Mede takes over his realm. Is it too much to ask of 21st century soi-disant Norwegian compassionate Progressives that they treat their Daniels with at least a small part of the courtesy and gratitude that a 6th century BC Babylonian tyrant showed to his interpreter of the writing on the wall? Today I saw an article where a lesbian in Canada is trying to take legal action against a Muslim barber who refused to cut her hair. Although humorous, it reflects what is yet to come in Western nations who embrace Islam. Phase one of stealth Jihad is to be friendly and grateful for having asylum. Phase two involves demanding more rights, mosques, halal meat, separate facilities for women, and sharia laws enacted. Phase three is total takeover and implementation of Sharia as is happening in Egypt today. Will history books reveal the 17 nations of the EU becoming part of the OIC increasing their numbers to 74 Islam nations? Liberals, socialists represent sheep among wolves. Liberty means the sheep get a vote not to be eaten. Websites such as this one are sounding out the alarm for the sheep to arm themselves against the wolves before it becomes too late. What the accusers refuse to see is what really made Breivik go mad, which was the situation and the outlooks on the ground which were created by the facilitators of multicult. Breivik grew up with multicult, and felt this on a daily basis, from childhood on. Hadn't Breivik been working on his "project" far longer than Fjordman has been writing, in the first place? Looking into the language and the tools that Breivik used, one may notice that they were taken from the islamic cult. He used the islamic tools turning them against the facilitators of the same cult. ncyrOt 70(the third has to be muslim, it swims around in ever decreasing circles randomly attacking anything it bumps into). I am not sure we should be preaching the defeatism of Jeremiah. Nor am I sure we should be preaching the peacenik saying of Jesus. Bring those before me, who would not honour me as their king, and kill them in front of me. Luke 19:26 if I remember correctly. See my next post, Context is Everything, for a response to this taqiyya. I am also Fjordman, living in the USA in Florida. Matt Bracken is my name. And the Fjordman inside of me sees our own Quisling traitors and other domestic enemies very clearly for what they are. I am Fjordman if all I have to do is stand in chains to die beside him. If there is any danger of history recording me as the author of things I have not the ability to write then I am not Fjordman as much as I would be. Given that, I AM FJORDMAN. I have a friend who still queries whether Breivik is mad. How else could he have got his message across he asks. Now we are beginning to wonder whether he was working for the Left as he has seemed to have enabled to acceleration towards a Marxist totalitarian Norway. He must know what his immediate legacy is as he sits in his prison cell. I wonder if he is pondering on what his ultimate legacy might be i.e. if he has brought Norway to this then perhaps he has brought closer the day when the multicultural dream might run its course.